We’re already starting to see reports filter through pertaining to the possible visuals and internal specifications of Apple’s next-generation iPhone, or iPhone 7 as it’s being referred to. So it’s only right and proper that alongside those reports we should also take notice of the designer-led visual concepts of what Apple could produce with its next iPhone model. Even if they do include insane features. And they don’t really come anymore insane than this iPhone 7 concept which comes with an integrated parachute system of all things. First and foremost, the “iPhone 7” shown in the video immediately makes it clear that absolutely no attention has been paid whatsoever to redesigning the aesthetics of the device. This particular concept is all about the creation and potential integration of one particular feature rather than the full overhaul of a device that is due and external and internal rebrand in 2016. The shape and size of the device remains the same. The iconic Home button with Touch ID sensor is still there, and even the speaker grille, rear camera module and hardware-based volume buttons are still in their exact same locations. What has changed is all under the hood, with the changes primarily meant to integrate the innovative, but entirely unfeasible ‘Parachute System’ that appears to be designed to protect the device from damage when dropped. 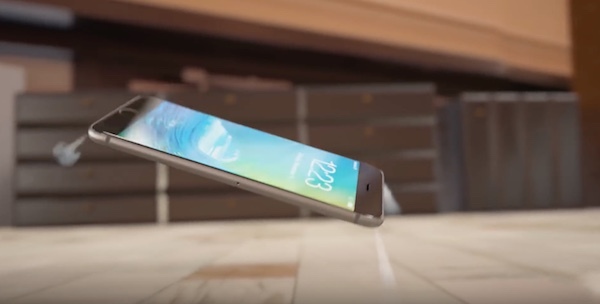 The designer is proposing that the iPhone 7’s built-in orientation, speed, & proximity sensor should work in tandem to detect when the device is free falling by monitoring its speed and distance from an object. When the speed increases, and the distance from an object decreases, an internal alarm would be triggered that then invokes the built-in CO2 tank to kick into action. 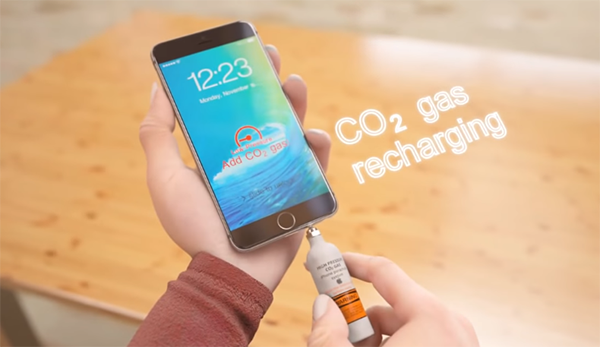 The internal CO2 chamber then vents its gas to a chain of nozzles located on the device that reduce the speed at which it is falling with the intention of bringing the phone to a controlled and gentle stop rather than crashing into the concrete. The CO2 chamber, once depleted, can then be filled up via a slot at the bottom of the device. There’s no denying that we’d love to actually test out a system of this nature and see if it actually works, but there’s very little chance of this ever seeing the light of day in a production device. Still, check out the video for yourself and see what you think. Probably will not happen any time soon as people keep “claiming” their iPhones and iProducts are producing extreme amounts of heat. Being the CO2 can explode under certain temperatures, it would be a very unwise decision to impose more health related risks to the public before assuring their products don’t reach increasingly high temperatures. Sadly and honestly, any product does have the ability to overheat just so happens APPLE can’t fix this major problem in a future hardware and associated software release -.-. Some of these concepts are so unrealistic it’s stupid. Great concept, just need to make sure the CO2 tank to fill it up has a lightning connector! And what about most people with half a brain-stem that use a case? Stupid concept. Not enough explosive power in the battery eh?